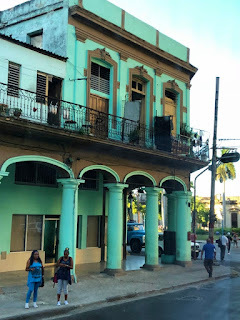 "" Writer's Wanderings: Port of Call: Havana! 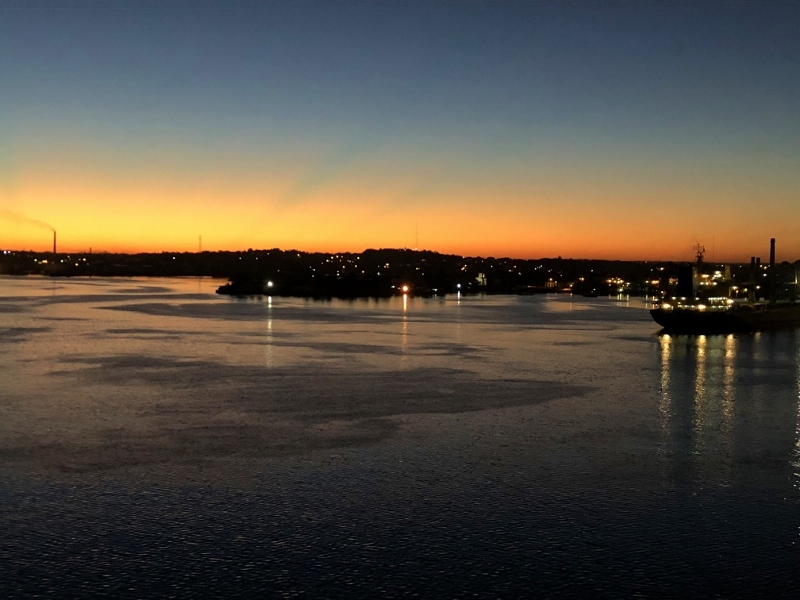 Our ship, the Oceania Sirena, arrived in Havana just as the sun was rising. We were already up on deck because our first excursion into Havana was at 8AM. 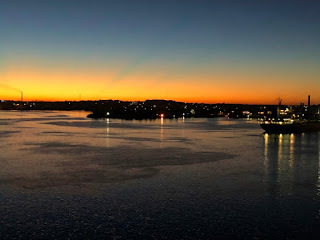 As we ate breakfast on the back deck of the buffet, we watched the sun rise and wondered about what we would see here. Old cars, to be sure. We were actually docked at a cruise terminal, the only one of three that was operational. The other two docks appeared to need extensive work to get them functioning. 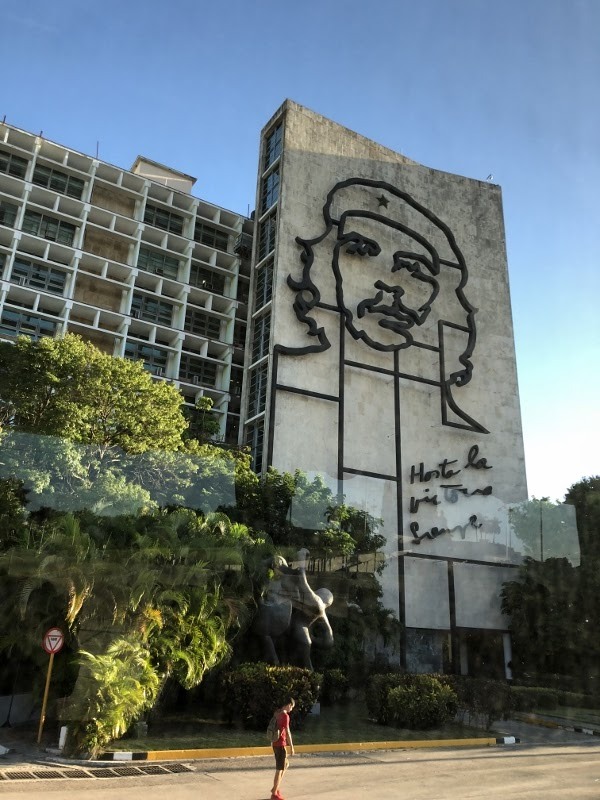 There was some talk that the cruise lines had tried to encourage the Cuban government to fix the others so more ships could be accommodated. I'm sure it will happen eventually as tourism grows. The routine was pretty much the same as the other immigration areas. Our passports were checked and our bags and purses x-rayed. I think they took pictures of us as well but I don't remember now. There were 49 steps down to the street level where our buses waited. We had been warned that that of the two elevators that were there, usually only one worked. I took the steps. I don't trust elevators when they don't have a good history of operation. 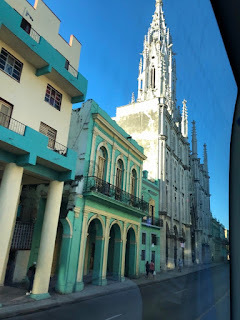 Our excursion that morning was called the Highlights of Havana and was basically a bus tour so some of my pictures are kind of funky as they were taken through the bus window and sometimes while moving. Our guide was an older gentleman and very interesting to listen to. We were starting to get some conflicting explanations of life in Cuba but I think that was because of each guide's perspective and of course the area of the country where they lived. Our room stewardess had told us she loved Havana because of all the pretty colors. She was right. The buildings were pretty pastels. It was a bit like the other cities we had visited in that there were still areas where you would have a very nice building flanked by two that were crumbling. Havana though was in a little better shape. The roads here were wide boulevards and there were lots of parks and green areas. We passed several very large and nice looking hotels including the Hotel Plaza. 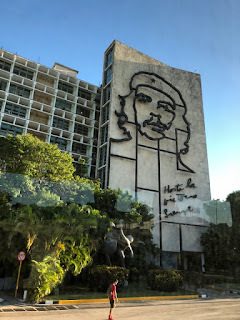 At the Revolutionary Square (every city seems to have one) we saw a large monument to Jose Marti and we passed by several ministry buildings with large profiles of revolutionary heroes on the facade. I recognized Che but not some of the others. By the way Che Guevera was only 39 when he was killed by the Bolivian army. He was actually from Argentina but fought in the Cuban Revolution with Fidel Castro. He went on to fight in other countries to promote peasant based revolution to combat injustices in third world countries. The iconic picture of Che was taken in 1960 by Alberto Korda seven years before Che's death. We stopped a moment in front of the University of Havana to see the steps and the statue that was sitting in a chair with her arms outstretched. I didn't get the significance until I looked it up. The statue is called Alma Mater which means "nourishing mother" in Latin. Who knew!? The face of the sculpture which we were too far from to see is said to be of the daughter of a professor at the time it was made. 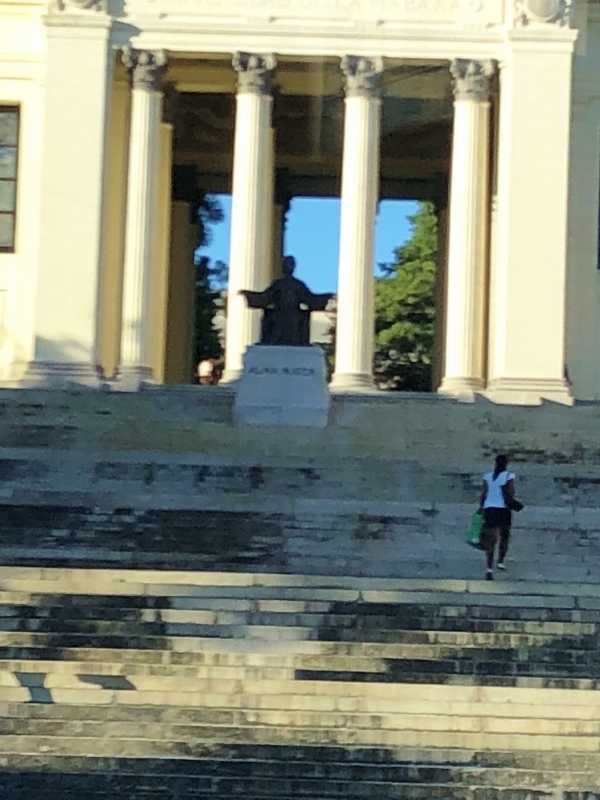 This is also the university where Castro went to school. A stop at the Christopher Columbus Cemetery would bring a few more interesting stories.